The new series of Doctor Who has seen Christopher Eccleston fight living dummies, restless spirits and aliens disguised as MPs, but he has yet to face his mortal enemies The Daleks. That will be rectified in a forthcoming episode entitled simply Dalek, in which the Time Lord finds that one of the metal killing machines has been collected by an unsuspecting billionaire. 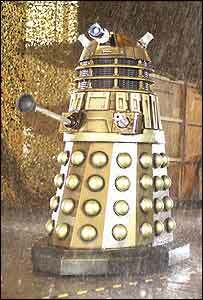 Voted the most evil Doctor Who villains of all time, the Daleks and their desire to "exterminate!" seem an integral part of the sci-fi series. But their return was almost ruled out completely by a lengthy dispute between the BBC and the estate of late Dalek creator Terry Nation. After the estate accused the corporation of trying to "ruin the brand of the Daleks" by wrestling control of their image, the dispute was resolved last August. As episode director Joe Ahearne explained, the Dalek confronted by the Doctor and Rose (Billie Piper) is a monster for a new generation. "The Daleks of the 1960s and 1970s would not make the grade today," he says. "They would be seen as comical rather than frightening. We couldn't have that." Stairs have not been a problem for Daleks since 1988, when they first levitated towards Sylvester McCoy in Remembrance of the Daleks. The new Dalek can also spin its torso independently of his head, so creeping up from behind is no longer an option. Its trademark "sink plunger" attachment also reveals a terrifying new function. "We have taken all the perceived weaknesses of the Dalek and made them deadly," says Mike Tucker, the BBC model unit's miniature effects supervisor. While Tucker operated the Dalek's head by remote control, Nicholas Briggs provided its chilling metallic voice and Barnaby Edwards sat inside its shell. "You would be amazed at the number of people who wanted to get inside the Dalek," says Edwards, who also operated a Dalek in 1993 BBC documentary 30 Years in the Tardis. "Sit on a swivel chair, put a dustbin on your head and you've got the same effect." The new Dalek is brought to life by a combination of physical models and computer-generated effects, with most of its movement made by remote control - to Edwards' relief. "Moving a Dalek is like trying to operate a fully-laden shopping trolley from the inside," he says. Edwards spent stints of up to four hours inside the Dalek body, watching the rest of the cast through an envelope-shaped gap. "I was inside the Dalek for as many shots as possible, so Chris had someone to play off rather than just talking to an empty shell," he said. The Dalek's voice, originally created by the defunct BBC Radiophonic Workshop, is now made by Briggs alone as he talks into a box device called a ring modulator. "Roughly a third of the lines in the episode are either spoken by the Dalek or Rose," says Briggs. "It never shuts up!" Usually presented as part of a legion, the Dalek appears alone in the episode which enables it to interact more extensively with the other characters. "A dustbin in itself is not scary, it's the performance behind it," adds Briggs. "In rehearsals we found ourselves talking about the Dalek's motivation!" Former Coronation Street star Bruno Langley appears in the episode as Adam, who helps the Doctor and his companion deal with the revitalised Dalek. "It was great to appear in such an important episode," he says. "My character gets on very well with Rose, which of course makes the Doctor jealous." The 22-year-old says he can now understand why actor Ewan McGregor found it difficult to act alone on the Star Wars movie sets, where characters were added by computer afterwards. "It made it much easier for us to have the Dalek physically there in front of us," Langley says. "But there were a lot of shots which had to be re-done because the Dalek got stuck in a doorway." The cast and crew remained tight-lipped about how soon the Daleks would return to further terrorise the Doctor. Tucker would only say ominously: "You will never get rid of the Daleks." Doctor Who: Dalek is on BBC One on Saturday 30 April at 1900 BST.